This past weekend I got together with some friends for a pot luck. I volunteered to make Oreo Truffle Balls. I have made them quite a bit in the past and people always love them. I don’t know where I originally got the recipe, somewhere online I am sure. Over the past few years of making them I have tweaked the recipe a bit and figured out what does and doesn’t work. Categories: Food, Recipes | Tags: Baking, chocolate, muffins, Oreos, pumpkin, truffles | Permalink. Categories: Food, Fun-Times | Tags: babysitting, Baking, family, sugar cookies | Permalink. I was spending some time with my favorite almost-5-year-old this weekend, when it occurred to me that making a rainbow cake might be a fun Labor Day weekend activity. I had been wanting to try it again and thought she would get a kick out of it. I mean what kid doesn’t love all things colorful? Three trips to the store, a detour to play with my dogs, and several hours later, we were baking away. She stuck around just long enough to stick her hands in the dry cake mix and lick the beaters. This time around I didn’t make Omnomicon’s “diet cake” recipe. Rather, I went the lazy and fattening route and just followed the regular cake mix instructions and used the ever healthy frosting-in-a-can. It went together quickly, the most time-consuming part being the mixing and layering of colored batter. It was a breeze to frost, even with the annoying domed shape of the cakes (I recently came across Wilton’s Bake Even Strips-must buy some and give them a try). The actual cake itself turned out a little crumbly, but still really good tasting and oh-so-cute! We ate the cake today for my Aunt’s birthday. It was quite adorable, if I do say so myself. Maybe not the most appropriate cake for a grown woman’s birthday, but it would be great for a child’s event or for cupcakes. I’d still like to perfect the cake, so I can’t say this will be the last attempt. I’m also pretty keen on making a “zebra” version with black/brown and white layers of chocolate and vanilla. I must also add: I fully recognize the utter “artificialness” of this desert. It is, after all, made with a boxed cake mix, canned frosting, and food coloring (albeit a minimal amount). Obviously, it’s not the most healthy thing in the world, but it’s fun to make and tastes pretty good. So, don’t leave me comments about how this is the devil on a plate. Don’t like it? Don’t make it! Categories: Food, Fun-Times | Tags: Baking, Cakes, food, rainbow | Permalink. Lately I have been trying to improve my baking and cooking skills. Cakes, brownies, Thai food, Chinese, Low-Card… You name it, I have been trying it. The reasons behind this new-found hobby are varied. One, I have never really cooked all that much and feel that it is time that changes. Two, as stereotypical as it sounds, I will be married soon (ish) and want to be that image of a domesticated wife and mother (to an extent). V’s mom is a fantastic and prolific cook. I would love to be famous for a certain dish or the go-to girl for delicious recipes. I do not, however, wish to be “domesticated” in every regard. V. is well aware that I don’t roll like that and that I expect him to share in every household responsibility equally with myself. Back to the topic: I have been looking into buying a Kitchen Aid mixer when I move to Bulgaria. I assumed, wrongly of course, that I could either A) buy one here in the US and, with a converter, use it in BG. OR B) buy one in BG. Well, option A is out. I read that converting the voltage doesn’t work with high-power appliances (including my beloved CHI straightening iron *tear*) and trying it will only result in blowing up the item. Option B is the only way to go, sort of. I have found that I can purchase one in the US online from any of a few different websites specializing in 220 v. appliances (http://www.kitchenaid220.com/, http://www.220-electronics.com/, etc) and then, somehow, smuggle it into BG in my luggage. Why exactly I have to smuggle it I am still trying to figure out. Does Bulgarian Customs really care if I bring in a food mixer? I might also be able to buy one online once I get to Bulgaria and have it shipped over. The problem? The cheapest I can find a Kitchen Aid Artisan mixer (nothing fancy, just the base model) in 220 v. is for $600! Categories: Food, Hobbies, Shopping | Tags: Baking, Bulgaria | Permalink. A few months back I came across a picture of a rainbow bundt cake on a friend’s Facebook page. Immediately, in true Whitney fashion, I began a voracious web quest to find any and all articles on the internet of rainbow cakes. 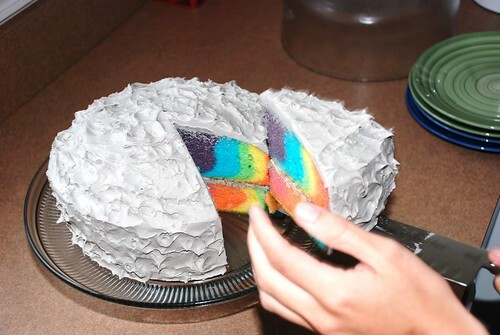 I couldn’t find any recipe or instructions for the bundt cake, but I did find a rainbow layer cake (thanks Omnomicon) and decided I had to make one. Now I should say that I am not an experienced baker, but I am doing my best to improve my skills, which is the main reason I wanted to try making this cake. Categories: Food, Friends/Family, Fun-Times | Tags: Baking, Cakes | Permalink.